It’s always so much fun to do a ‘before and after’ room post. Without wasting any time our new dining room…. And this is what we started with, blank builder white. After adding a coat of paint, an 11 hour stencil marathon, and some art here is the new dining room. My camera acts weird sometimes, the stencils kinda disappear in some of the shots. So I’ve tried to take pics both in daylight and at night and with different settings. I don’t know how to best describe the paint color; it is not yellow or peachy, may be it is more buttery with a peachish tint to it. I know I am not making sense. All I know is, it is a happy color and every time I see it makes me feel like I’ve step into sunshine. It just lifts up my spirits. The after shot. You can see the stencils really well in this one. Now for the last pic completing the 360 degree view of the room. « DIY Paisley Pattern Art for $5! 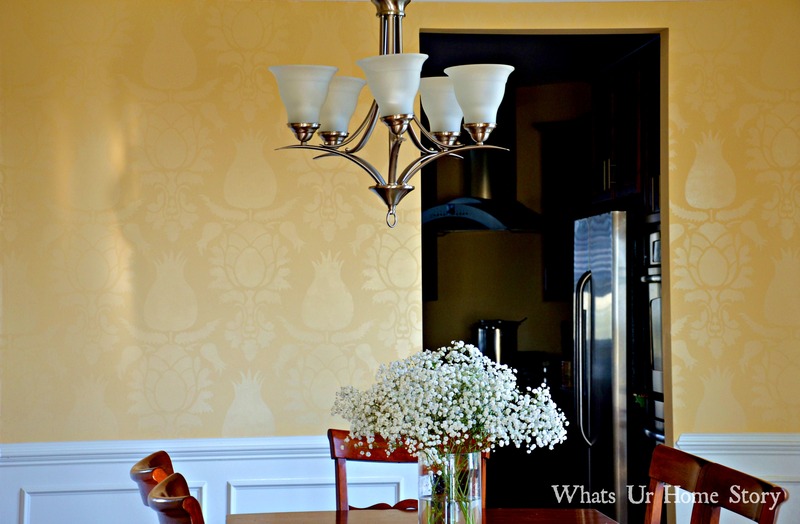 I adore your walls-the stencil is so rich and charming-following you from TDC-stop on by for a visit! Glad you like it Claire. It was hard work but well worth the effort, I think. Loved you blog. Thanks so much Melanie. 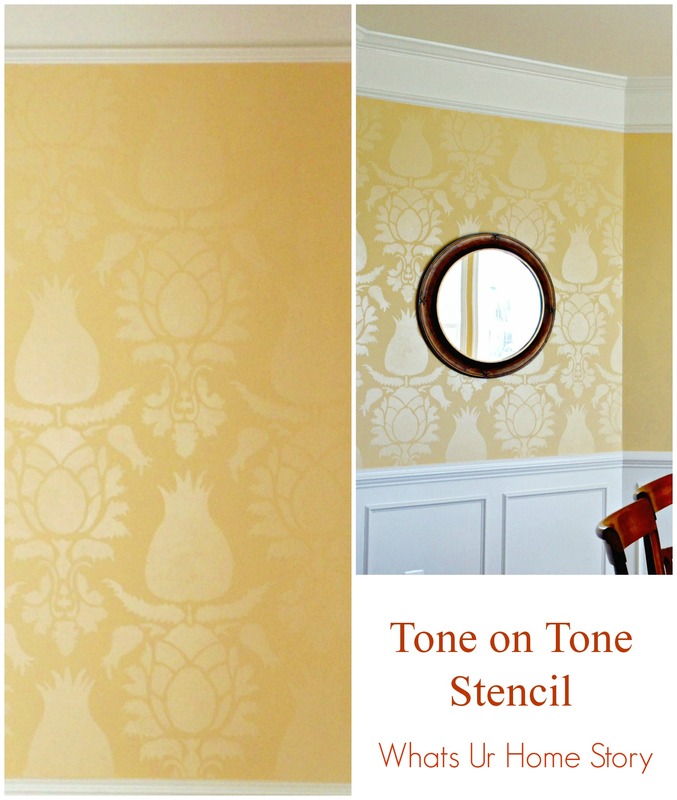 I’m totally sold on stenciling. Planning to do a guest room in either Casablanca Trellis or Chez Sheik. Can’t seem to decide which one. They are so pretty. Your work is so beautiful I can hardly breathe. But, why, oh why, would anyone put that inappropriate and ugly art work on your beautiful walls? Glad you liked the stenciling. LOL (on the second part of the comment). 🙂 The painting is of the Hindu God Ganesha, one of the best known and most widely worshiped deities in the Hindu pantheon. You can see at least one painting or statue of Ganesha in every Hindu home. This type of painting is called the ‘Kerala mural painting’ which is a fresco depicting mythology and legends usually found in ancient Hindu temples. This style of painting dates back to the 9th to 12th centuries. This was my second attempt at a painting anything on canvas ever. Just to let you know, majority of the 1B+ Hindus all over the world would consider the latter part of the comment offensive. Thanks for visiting my blog. Hope to see you around more. Fabulous stencil work! The room looks a lot richer in the after pictures. I actually like that you used a high gloss version of the same paint color – it makes the room look formal, appropriate for a dining room. No words to describe the beauty of the Lord Ganesha mural! The orange background really stands out on the yellow walls. Thank you Vipula. So glad you liked it. Thanks Sunayana. Totally agree. I’ve been wanting to do another stencil project but haven’t had the time to commit a few hrs towards for so many weekends now. Hope to see you around more. Great to hear you love Ganesha too. There is some thing about him that makes every one of his art works/statues look different. Wow, that was a long trip. The last few trips that we have been to have been much shorter. Where all did you go? My childhood friend and I traveled to Bombay (still Bombay back then), Bangalore, Pune, and Madras. We stayed with my friend’s family and friends the entire time which made it extra nice – to be in the homes of people we knew and to see the day to day comings and goings of life (not to mention home cooking!). That sounds like an awesome trip. You guys did cover some ground there. Next time if you get a chance to visit, do check out Kerala (that where I’m from) and Rajasthan. Two very beautiful yet completely diff states, one tropical the other arid/ deserty. Wow! Looks great, I love that bright cheery yellow! Thanks Melissa. It is such a happy yellow. Lifts my spirts up every time I walk into that room. Glad we could connect. Hi, I am new to this site. Simply love your work there. Very inspiring. A very nice personal touch. Love this, it is really pretty. On my computer screen your color looks like my favorite honey that comes from bees that feed on a field of wildflowers. 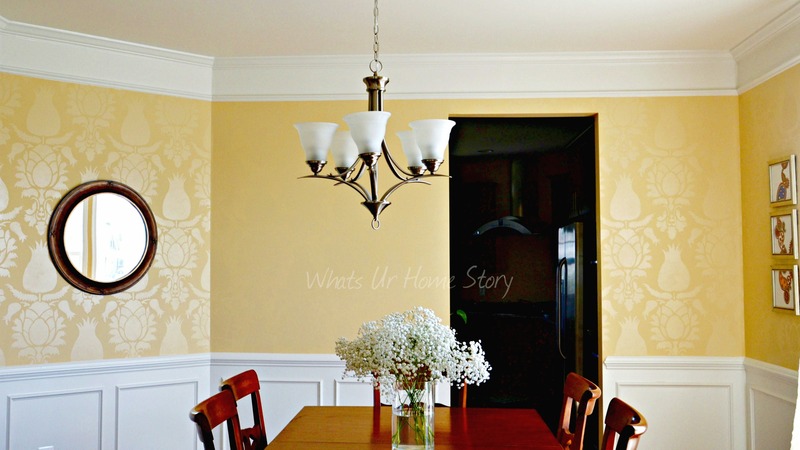 Your dining room looks lovely, such a huge difference before and after. I love the gloss paint idea. I am about to do something similar in our dining room – thanks for posting your inspiration photos. House proud – from Australia.